Blaine, a small community in Belmont County eight miles from Wheeling, West Virginia, is home to Ohio's oldest sandstone bridge. The historic Blaine Hill "S" Bridge was built in 1828 as part of the National Road project, the first road funded by the federal government. 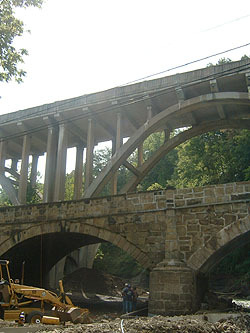 Not only is it the oldest bridge at nearly 178 years, but the longest at 345 feet and the last of the "S" three-arch sandstone bridges on the National Road. Its 6.3 percent gradient from east to west made travel much easier for the early pioneers moving west and having to climb the 500-foot hill out of the valley, as well as across a tributary of the Ohio River called Wheeling Creek. The Blaine Bridge, looking south with SR-40 overhead. In 1994, the crumbling Blaine Hill Bridge was closed to traffic. In 2000, the Ohio Department of Transportation authorized the reconstruction of the collapsing western end of the bridge. 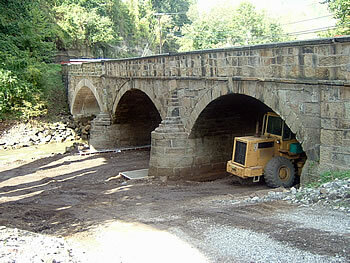 Other parts of the bridge were also deteriorating from loss of mortar and stone displacement and fracture. Sections of the original stonewalls had shifted due to the loss of backfill during periods of high water and substantial rainfalls. The deck, superstructure and substructure were all in very poor condition. In 1999, the bridge was saved from demolition when the Blaine Bridge Community Preservation Project was formed. At the January 4, 2003 meeting of the Blaine Bridge Community Preservation Project, Sue Douglass, Chief Officer of the project said, "Our Bridge was a vital link in United States transportation history, an essential connection to this country's entire history. It is our responsibility, our obligation to preserve this treasured artifact, which tells the story of the American Adventure." Considered one of the most historically and architecturally significant structures in the state, The Blaine Hill Bridge was designated as Ohio's Official Bicentennial Bridge to commemorate Ohio's 200 years of statehood celebrated in 2003. An Ohio Historical Marker was dedicated at the site in July 2003. Westerly view of 3 arches of the Blaine Bridge. The Bridge is safely located below-and about 100 feet from-the base of the Route 40 viaduct at Interstate 70. The preservation project should be complete in June 2005, providing future generations of Americans the chance to see and touch another piece of history. Photographs and information provided by Gary Davis, Rural Programs Engineer, FHWA Ohio Division.